Faridi-ul-Din Attar (or Faridudin) was born in Nishapur, in the Iranian province of Khorasan and died in the same city. He has often being referred as Farid-ul-Din of Nishapur. The word ‘Attar’ (perfumist) derives from Arabic/Persian word ‘Iter’ meaning perfume. Attar therefore refers to profession of Farid-ul-Din which eventually became more of his pseudonym. Farid-ul-Din left his profession to travel for the ultimate question of discovering oneself. It is being reported that he was at his shop when he encountered a Sufi at his shop. 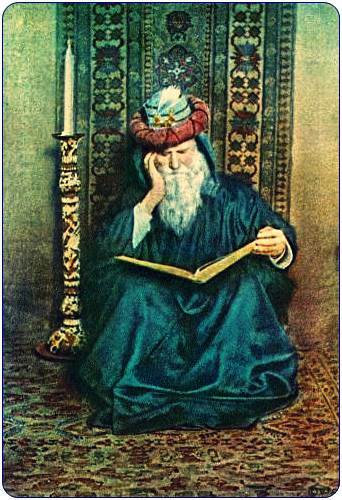 The event influenced his life so much that he abandoned his perfume shop and went on a spiritual pilgrimage to Kufa, Mecca, Damascus, Turkistan, and India, meeting with Sufi sheikhs – and returned to Nishapur promoting Sufism. 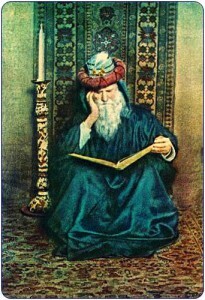 Ilahi nama and Manteq al-Tayr are his greatest works. Mantaq ul Teer (The conference of birds) is his most famous writing, which discretely tell of man’s journey towards perfection and unity with God via a mystical account of birds trying to survive painstaking journeys through 7 valleys to meet Simurgh, a mythological a bird. Each of the birds representing a certain attribute or sin. The journeys undertaken by birds profoundly represent the spiritual pilgrimages of man, in quest of the God, as he goes through different phases. All the birds, based on their natural flaws and shortcomings, present excuses not to travel. These excuses are explained further via Hakayaat, or Moral Stories. All birds perish this difficult journey, except 30 birds. When the reach palace of Simurgh, the real surprise comes when they meet Simurgh. They see Simurgh as their reflection together. The word Simurgh in Perisna means 30 birds itself, hence it’s the story of Man on a hard quest to discover God via discovering himself, and eventually annihilating himself (concept of Fana Fillah in Sufism). Mevlana Rumi mention highly of Faridudin Attar, calling him a pure soul. In the introduction of the secrets of the self, Iqbal has also paid his homage to Attar. In Gushan e Raz e Jadeed, he again pays a tribute to the great poet. In the Book of God (Ilahi-nama) ‘Attar framed his mystical teachings in various stories that a caliph tells his six sons, who are kings themselves and seek worldly pleasures and power. Read the Abridged text from Illahi Nama in English here.